So a long day of hiking has finally come to an end, you snuggle up inside of your sleeping bag and you just cannot get comfortable… it is still too cold! The worst possible situation, at least for me, on a camping trip is being too cold as you are in your tent or tarp structure. There are several ways that you can keep this structure nice and cozy though, from space heaters to heated rocks, so no need to worry! Any experienced backpacker or camper will tell you that the best way to stay warm in your tent is a quality sleeping bag. I am the biggest supporter of spending extra money on the more expensive bag because it matters more that you have a bag that will take care of you in whatever weather that you endure. To have the best quality bag in whatever weather, make sure that your bag can handle sub-zero temperatures. Though also look at the temperatures that you are going to endure in the area you are going and get a bag that matches that area. Also buy a mummy bag, which is a bag that goes over your head to make sure that your head is warm. In rectangle bags, you lose a lot of heat and you also end up losing a lot of money you spent on them. Your sleeping bag is slowly going to become your best friend on your days with it, so make sure to take care of it and not to get it wet and dirty, this will ensure that it will stay warm as well. Treat your sleeping bag well and it will treat you well. While many people may turn to an air mattress while they camp, it does not offer you the same kind of warmth that a sleeping pad will. A sleeping bad keeps the cold air out of your tent by creating an extra layer of insulation. REI even recommends in situations of extreme discomfort you can put your sleeping pad over your air mattress, but you will not receive as much insulation as just sleeping on your sleeping pad. So I personally recommend just sleeping on the sleeping pad, it may be cold at first, but it will be worth it later in the night. The image above shows a more expensive sleeping pad that is made like a thermal blanket to keep you warm in thermal temperatures and may be the best choice for you if you know that you will be camping in cold areas like Canada or Alaska. There is even a better choice for those of you who need the mattress. There are sleeping pads with the mattress built in! Thermostat Sleeping Mattresses have the perfect combination of having the built in support of having a sleeping mattress and the warmth of having a sleeping pad. You will never have to choose between the two, though they can be a little bit exspensive. This tip is one of my personal favorites. Going to bed with hot water bottles in your sleeping bag. This is a very simple and very cheap trick. 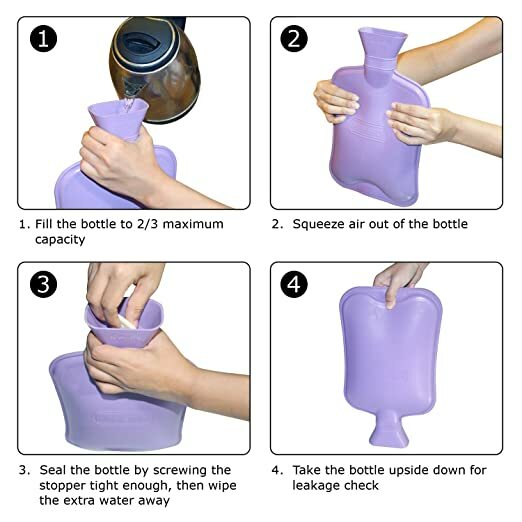 You can buy hot water bottles at many different places including your local convenient stores and pharmacies. By buying these, I usually bring two, you can follow some simple steps to be able to keep yourself warm in your tent and fall fast asleep. You first warm water over the fire you have made, outside your tent of course, and poor it inside of your hot water bottles. With these water bottles now full, you bring them into your sleeping bag and after you are comfortable you find the two places you are the coldest and place the bags there. The bags will slowly start to warm them and will find that you will slowly start to fall asleep along with the warm spreading. If you find the bottles to be too hot, you can also get cozies for them. You can get them handmade (my personal favorite) or you can get them just as a nice thin layer so it doesn’t burn your skin. Or if you really want you can wrap them in a small hand towel. It is an easy fix to an uncomfortable situation. Yes, these really exist! Crazy right? So there are certain brands that make space heaters that are just for tents. It might sounds a little scary at first to have a space heater in such a small and flammable area, but trust me, these little buddies are made just for these areas and work like magic. One brand in particular has a great reputation in the camping world: Coleman Blackcat Catalytic Heater. In fact it is such a popular space heater that is almost sold out on amazon all the time, you have to go into REI and or call Coleman and get onto a waiting list to get this baby. Though if you try to run this heater all night you might wake up in the middle of the night sweating, so it may be smart just to run it for an hour or two before you go to bed and let the remaining heat keep you warm through out the night. Though if you know the temperatures are going to be way too cold for you, feel free to run it all night, it won’t hurt you. I might be jealous you get one before me though. This is the most interesting option you can try, but it surprisingly is one of the easiest ways to heat up your entire tent (and your toes). While you still have your fire going outside, you go outside and find some decently sized rocks. Nothing too large, about the weight of 5-10 pounds. You can put these rocks into your fire for about forty-five minutes to an hour. After that time passes pull your rock away carefully (not by hand), and let it cool. Now in a thermal blanket wrap up the rocks and put them at the foot of your sleeping bag. This will not only keep your sleeping bag nice and toasty, but this will keep your tent nice and toasty. There have also been several travelers that I have met that have chosen to hang these rocks from the ceiling. I have attempted this trick, but I have found it does not give me anymore heat then just putting the rocks near my toes, plus I like keeping my toes the warmest part of my body, but you are more then welcome to try. This will be something that I would recommend someone with the rig​​ht equipment to do and not to attempt it if your rock still has sparks or flames still on it. You do not want to burn your tent down! I hope that you have enjoyed these five tricks that I use to keep your tent nice and warm. Now that you know them you will never have to worry about a sleepless night because of the snow, dampness or the roaring wind anymore! Make sure to share this with your friends to keep them safe and warm on cold winter nights! Let me know what are your tips for keeping warm in your tent in the comments below! Want to know more about how to choose the best 4 person tent? Read our review here.